Autistic kids' bike options include typical bicycles, augmented bikes and tandem cycles. It's necessary to determine the child's specific needs when selecting a bicycle. Many kids with autism have no problem riding bicycles but many may be apprehensive about riding. Gross motor and sensory processing problems can make cycling difficult and proprioception is a significant factor. Proprioception involves the ability to position the body in relation to sensory input. The process helps people develop new skills that require attention to more than one activity at a time. For example, a child learns how to pedal the bicycle and steer without needing to look at his hands and feet. A Kennedy Krieger Institute and Johns Hopkins University School of Medicine study conducted by Stewart H. Mostofsky, MD and his colleagues suggests that the autistic brain relies heavily on its internal proprioceptive sense and less on visual input from the environment. Many children on the spectrum can overcome the challenges they face with guidance. A special autistic kids' bike may be helpful in some cases. 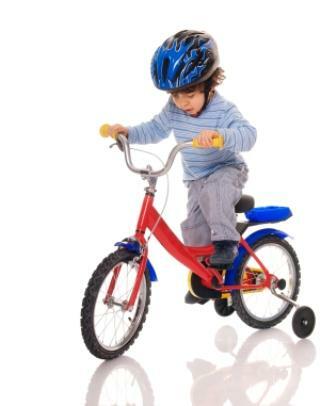 Using a systematic approach to riding can help children on the spectrum master bicycle riding. The approach requires mastering individual steps rather than trying to master all skills necessary to ride at once. For example, the child would begin by standing while holding the handle bars and progressively move to balancing on the seat, and so on. If challenges are too overwhelming, an augmented bike for autistic kids may help. A three-wheeled bike for kids with special needs is more stable than a traditional two-wheeled bicycle is. While models are readily available, they can be very expensive. Special Needs Bicycles 4 Kids offers a viable option that allows you to turn a regular bicycle into a children's special needs bicycle using a conversion kit. TrikeZilla produces the conversion kit that can be used to add sturdy wheels to the bike. This approach is nice because you have the option of removing the conversion axle after the child demonstrates mastery and is ready to move on to the next challenge. In some cases, extra guidance is necessary. Riding a bicycle is an excellent sensory integration activity that can help a child on the spectrum learn how to process motion while enjoying tactile, visual and auditory input in the process. The outdoor activity helps develop a sense of balance and it exercises important gross motor skills. While an autistic kids' bike isn't necessary for every child, some may benefit from augmented or specialty bicycles.